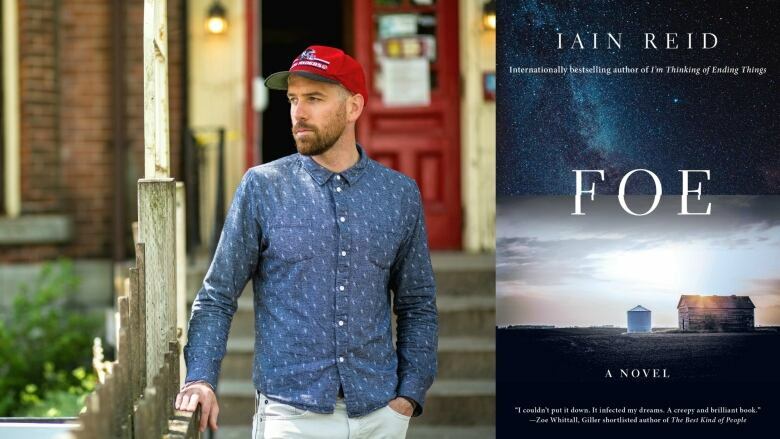 Iain Reid, author of the new novel Foe, takes the CBC Books Magic 8 Q&A. Iain Reid's new suspense novel Foe takes place in an old, isolated farmhouse in the not-so-distant future. The house is inhabited by Junior and his wife Hen, whose peaceful lives are interrupted by the arrival of a man in a business suit. Junior has been randomly selected for a scientific program and will be leaving home for the indefinite future, while his wife stays home with a companion. The shock of this announcement, coupled with his increasingly distant wife and the intruder's vague explanations, sends Junior in a tailspin, as he races to figure out what's really going on. Below, Reid, who also wrote the novel I'm Thinking of Ending Things, takes the CBC Books Magic 8 Q&A. 1. Linwood Barclay asks, "Does writing get easier the more you do it, or more difficult because you don't want to repeat yourself?" I've found writing of any kind, but especially fiction, is always difficult for me. It never feels easy. It's a struggle. I don't think it will ever feel easy, and likely will get harder. I think if it ever feels straightforward, I will do something else. 2. Marina Endicott asks, "What is the line of prose or poetry that comes to you in the dark night of your soul?" I can't remember where I first came across this line from Gotthold Lessing, but it was years ago, and I was intrigued enough to scribble it down on scrap piece of paper: "There are things which must cause you to lose your reason or you have none to lose." I still have the (tiny) piece of paper in my desk drawer and like thinking about how it can be interpreted. 3. Patrick deWitt asks, "What is the last thing you read that made you feel actually jealous?" Earlier this year, I had the chance to meet Gwendoline Riley in Iceland, where she was teaching for a few days. She was smart and funny. Her novel, First Love, comes to mind as a recent one that I both really enjoyed and admired. 4. Nazneen Sheikh asks, "Have you ever been frightened by what you write? How and why?" I'm often frightened by what I write. What I'm writing tends to be personal, and is concerned with ideas/concepts that unsettle me, and ones I'm uncertain about it. I find that these novels, despite being fiction, are more revealing of what I actually think and worry about than my memoirs. Usually, I start with some kind of question or conflict, and that will usually lead to more questions. With Foe, I started by thinking about the tension between confinement vs space. 5. Tracey Lindberg asks, "What book is on your nightstand right now? How long has it been there?" An electrical engineering textbook, System and Signal Analysis (second edition). The first paragraph states: "The reader is assumed to have had courses in general physics, including simple circuit analysis, and elementary linear algebra. Some knowledge of differential equations is helpful but is not essential." It's not traditional bedtime reading. I'm actually "reading" it for research for a new project. It hasn't been on the nightstand for long, maybe a week. It started on my desk so I could go through it when awake and alert. Then, it sat on the floor beside my couch for a while. Now, it's right beside my bed. It's making its way to me slowly. 6. Chevy Stevens asks, "Do you ever read your reviews? Do you learn anything from them?" I'd probably prefer not to, but I do read some because it's tempting. I also understand they aren't meant for me. I don't think I learn much from them. 7. Hartley Lin asks, "What activity that has nothing to do with writing do you highly recommend to other writers?" I like walking. I walk most days. It's helpful for clear thinking and muddled daydreaming. Sometimes, if I'm working and stuck, I like to just lie down on the floor. 8. Ian Brown asks, "What was the lowest point in the writing of your latest project? And the highest?" The lowest point was the beginning, when a coherent, finished book felt impossible and far away. The highest point was when the book was finally finished. I never knew or believed I was going to make it, until the very end, which arrived more with a sense of relief than accomplishment.